The Egyptian Organization for Human Rights (EOHR), a non-governmental body, has refuted claims of forced disappearances in Egypt while calling on lawmakers to tighten oversight over state security service regarding the matter. According to EOHR President Hafez Abu Seada, the interior ministry said 500 people, out of a total of 700 who were reported to have been forcedly disappeared in complaints received by the organization since 2015, are detained pending trials. Other cases included people who turned out to belong to terrorist groups and have been announced martyrs by their groups for taking part in terrorist attacks, or people who have illegally immigrated from the country, Seada said. 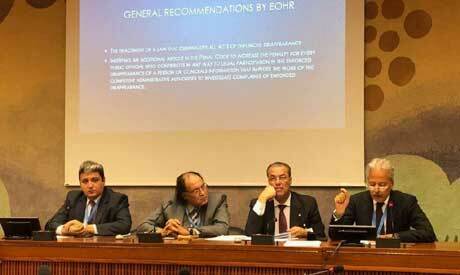 Seada made the remarks during a seminar on forced disappearances in Egypt held on the sidelines of the 39th session of the UN Human Rights Council in Geneva on Wednesday. Egyptian authorities have in recent years faced accusations from international rights groups of using enforced disappearance as a key instrument to stifle dissent. Authorities have repeatedly denied the allegations. Seada urged the Egyptian government to respond to all complaints about forces disappearances from local rights groups and the UN's Working Group on Enforced or Involuntary Disappearances as a key measure to address the matter. The organization's secretary-general Essam Shiha has called on Egypt's parliament to tighten control on security authorities to ensure it does not contravene the Egyptian constitution and relevant legislation criminalising forced disappearances. He also called for passing a law criminalizing any act associated with forced disappearances, whether by taking part, aiding or incitement.